Australian Superbike racer and former Champion Glenn Allerton (14). Photo by Andrew Gosling/TBG Sport, courtesy of Motorcycling Australia. 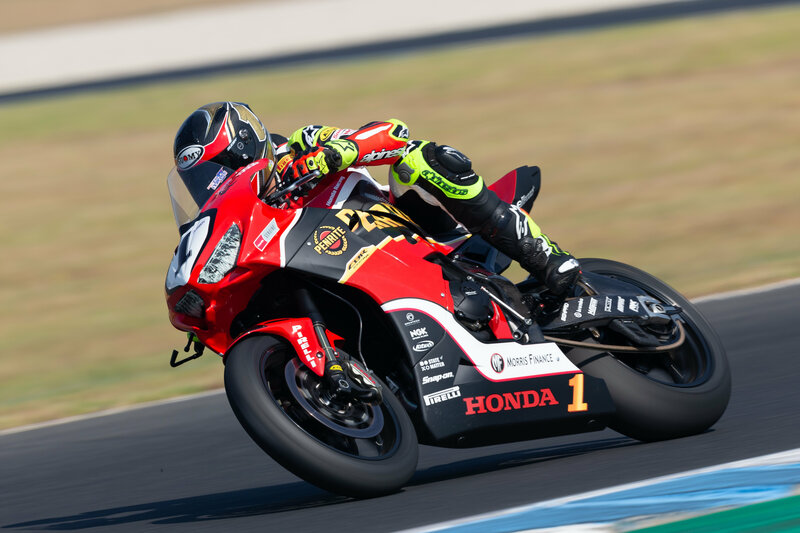 As the 2019 Motul Pirelli Australian Superbike Championship (ASBK) heads to Wakefield Park in Goulburn, New South Wales (NSW) for Round 2, the riders prepare themselves for a very different challenge to the one they faced at Phillip Island for Round 1. The tight, twisty layout in NSW’s picturesque Southern Tablelands region is a stark contrast to the fast, flowing nature of the Island circuit, meaning that the close-quarters action we saw at the Island is only set to increase as we move to a technical Wakefield Park track. We always seem to have an absolutely amazing Round 1 at Phillip Island, and it seems I always go into Round 2 at Wakefield Park thinking it can’t be any better than the Island, but it always is. The racing just seems to amp up at Wakefield because of the completely different dynamic of the circuit compared with Phillip Island; the tight circuit brings different riders to the front. It’s a track where we see Troy Herfoss (Penrite Honda Racing) always perform strongly, and he needs to this time round after the result he got in Round 1. On the tight track it’s cut-throat when it comes to passing manoeuvres, and with the tension between some of the riders on track, especially Aiden Wagner (Yamaha) and Wayne Maxwell (Team Suzuki ECSTAR Australia), it’s going to be an absolute pressure cooker. (Above) Troy Herfoss. Photo by Andrew Gosling/TBG Sport, courtesy of Motorcycling Australia. Wagner and Maxwell were the talking point after Round 1, with their on-track clashes culminating in the last-corner incident which saw Wagner taking the win and Maxwell crashing out. Do you expect more fireworks from that pair this weekend? The way that Wagner rode at Round 1, he’s made it clear that he wants to win every race and that he’s not out there to make friends, that’s for sure. It’s a good strategy, but a dangerous one because that little bit of space that a rider may have left you in the past might disappear next time around. Wagner was certainly on fire at Phillip Island, if there’s anyone he didn’t want to cross, it’s Wayne Maxwell and he’s managed to do that! Wagner’s certainly going to be one to watch. (Above) Aiden Wagner (28) and Wayne Maxwell (47) at Phillip Island. Photo by Andrew Gosling/TBG Sport, courtesy of Motorcycling Australia. Who else should we be keeping an eye on? 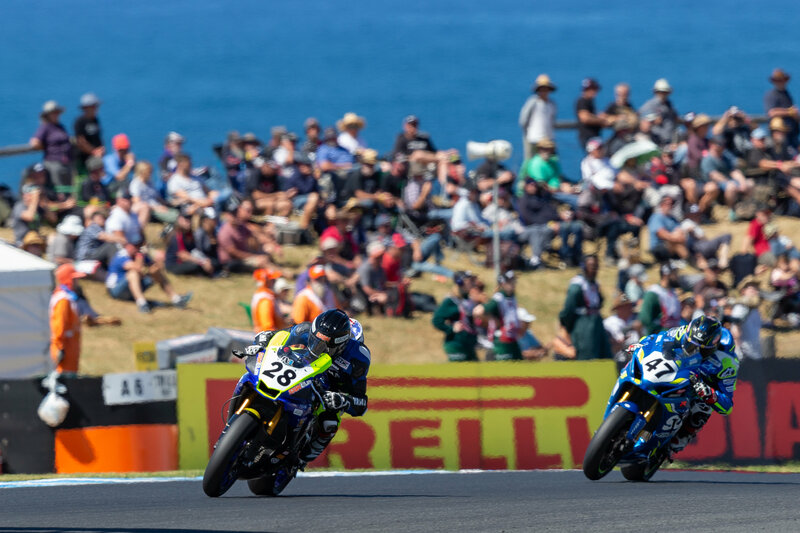 There’s certainly plenty to play for and guys like Daniel Falzon (Yamaha Racing Team) and Josh Waters (Team Suzuki ECSTAR Australia) are guys that can pick up the pieces and challenge for points this weekend. And let’s not forget Kawasaki. BCperformance have been doing a fair bit of testing so hopefully they’re up the front too. Mike Jones (Desmosport Ducati, replacing the injured Troy Bayliss this weekend) just gets stronger and stronger every year. He’s our 2015 champion, but that ride he had at Phillip Island in the final race, getting the lap record as the first guy into the 1:31s on a privateer, old-model motorcycle was impressive stuff. Now that he’s riding the Panigale expect to see Mike Jones featuring in the major results. 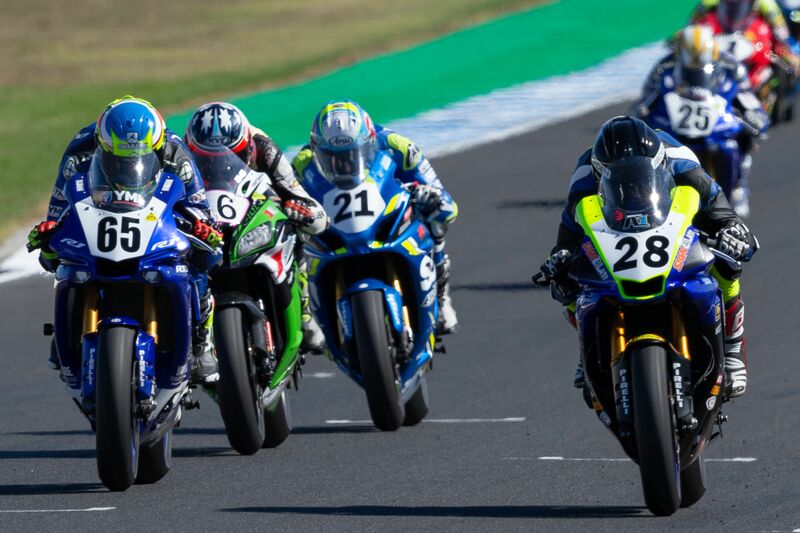 (Above) Aiden Wagner (28) leads Cru Halliday (65), Bryan Staring, Josh Waters (21), Daniel Falcone (25) and the rest of the field at Phillip Island. Photo by Andrew Gosling/TBG Sport, courtesy of Motorcycling Australia. This weekend’s event also includes Round 1 of the brand new bLU cRU Oceania Junior Cup, a junior academy for 26 of Australia and New Zealand’s most talented young road racers. You’ve seen them in testing, you must be looking forward to seeing the participants finally get the chance to go racing? I feel honoured to have seen the competitors testing at the ASBK Official Test at Phillip Island earlier in the year, and I had butterflies in my stomach when I saw the young guys and girls out there. It’s really the future of our sport. To be present the first time they hit the track and race, it’s a huge honour for me and will be something that I’ll cherish. it’s a great initiative to bring young people through our sport and it just shows the passion that Motorcycling Australia have for supporting the next generation of riders. Boy, am I excited to see those kids hit the track! Grab your tickets now for Round 2 of the Motul Pirelli Australian Superbike Championship at Wakefield Park (March 22-24). Head to ASBK.com.au for more details and to purchase. Catch all the action from Wakefield Park this weekend live on SBS and Fox Sports. Check local guides for details. Live extended coverage is available wherever you are in the world at ASBK.com.au. For more information and updates, follow the ASBK on Facebook and Instagram.